Anderson asked a pertinent question tonight: Will the Democrats wind up in a brokered convention? There is a good chance that will happen - unless one of the candidate breaks out before then. Barack Obama is the one who has the first chance for a breakout: Between now and March 4, there are nine primaries and caucuses on the Democratic side and Barack is favored in most of them. One of the nine where Hillary wants to stop him is Virginia - a state that many have thought would be close. That's why it was notable today that a couple of Virginia polls said he has a double digit lead. If he wins big there and elsewhere, he could build up a full head of steam. For Hillary, the best chance for a breakout comes on March 4 in Ohio and Texas. And she might just do it - like Bill, she is good at comebacks. But I think she has to put some brakes on Obama before then. That's why the states coming up in the next couple of weeks are more important than many commentators think - they could have a big impact. Worth watching closely. Hey everyone, I'm in Los Angeles tonight. I flew here this morning because I have to shoot a story over the weekend for 60 Minutes. I will be live blogging again tonight. We are still working out the kinks, but I really enjoyed it the other night so we will keep going with it. I actually used to do this a long time ago. If any of you ever watched ABC’s World News Now about eight years ago when I was anchoring, you may remember that we used to have a live chat component online. It’s a lot of extra work, but it’s nice being able to respond to people in real time. I guess the other night someone posted something pretending to be me. They ended the posting with a smiley face. Just for the record, I stopped using smiley faces and bubble hearts in 2nd grade. We are focusing a lot on politics tonight, but we will be showing you another celebrity announcer audition as well. I'm very excited about tonight's auditioner. She has a very distinctive voice – perfect for 360°! Editor's note: Please keep your comments focused on the content and context of the live program. We'll start posting at 10p ET and close the blog to comments at 11p ET. 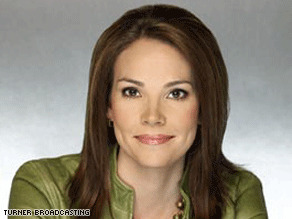 We’re thrilled to have Erica Hill join 360° as a full-time Anchor/Correspondent. She’ll make her debut next week. She has closed up shop in Atlanta and is making the big move to New York. This is a big, strange, and sometimes scary city. We’re thinking of ways to ease the transition for Erica, so she’s comfortable in her new digs and and not too freaked out about relocating to the Big Apple. That’s why we’re presenting her with goodies essential to every true New Yorker. We’re doing our part to make Erica feel welcome. And we’d like to hear from you. Give Erica some reasons on why she’ll love NYC, and maybe offer up some tips on how she can make the most of the city. Even if you’ve never been here, I’m sure you have some great ideas. Doing the math on superdelegates. It ain’t pretty. I’m sitting here doing math, which, trust me, is not my long suit. I’ve been adding, subtracting and dividing the numbers for an hour, and the conclusion of all my numerical prognostication seems absolutely clear. If Hillary Clinton and Barack Obama continue running as close as they have, neither one will arrive at their party’s convention with enough delegates for the nomination. Even if they split the remaining super delegates, the result will be the same. I won’t try to walk you through all the math because it is too confusing, and frankly because it is now a vicious scribble of notes piled all over my desk, and it’s all making my neck ache. I need aspirin. And maybe an election process that makes more sense. Anyway, this is bad news for the Democrats, for at least two reasons. One: When parties remain split late into the campaign season, they often pay a terrible price. They don’t enjoy the run up time of a united team heading into the general election - for rallying voters, raising funds, working out sticking points in their platform. Two: If the elite members of the Democratic Party, the super delegates, have to settle the race ultimately by hand-picking either Obama or Clinton, the losing side is going to scream. Independent and moderate voters won’t like it. And, again, the nominee will likely pay in the general election. Anyway, I’m cranking away on some maps to explain all this on the show tonight, but if you are a Dem out there, I’m warning you, the picture is not pretty. Maybe the Dems will pull it together. Maybe Obama or Clinton will finally break out and put the other candidate away. Or maybe we’re in for a very ugly finish to a very long race. Happy Friday!!! The battle for the White House rages on. The candidates have a jam-packed weekend with more primaries and caucuses. Stay with CNN for the best political coverage. In Crime & Punishment, we have an update on the deadly shooting at a City Council meeting in Kirkwood, Missouri.The gunman killed 5 people before being shot to death by police. The brother of the gunman told CNN he “went to war tonight with the people that were of the government." Former Hollywood madam Heidi Fleiss has new legal troubles. Check out the link to her mug shot below. It’s a memorable one. And, on a lighter note, rock on people! The 50th Grammy Awards are this weekend. Will your favorite musician win? Can McCain unite the GOP? You guys rocked it last night with our caption contest! Who knew a slice of Beat360 could be so much fun... Oh, what's that? Back for more? Ok then, let's do this! "Little girl, it looks like you are leaning to the right... here, let me help you"
NEW YORK – I have blogged before about voter ID laws but I feel compelled to do so again, this time to address the problem of disenfranchisement that results from the ID requirements in place in some states. Jami Floyd is an In Session anchor and frequent contributor to the AC360° Blog. If you get to the polls in those states and don’t have a valid ID, you don’t vote, though in some states voters without ID have the rather onerous option of signing an affidavit, i.e., swearing under oath, that they are who they say they are – to secure their right to vote. Supporters of these ID laws claim to seek a solution for the problem of voter fraud. But here’s the problem: The problem isn’t a problem. It doesn’t exist. In Indiana, the state with perhaps the most restrictive voter ID law in the country, there has never been a single reported case of fraudulent in-person voting. The last two presidential elections in this country have been terribly close. In 2000, the race between Al Gore and George Bush was, quite simply, too close to call. The lesson: Every vote counts. Let’s hope the Supreme Court does the right thing by our democracy. The Court should strike down the Indiana law and strike a blow for this fundamental principal of our democracy - the right to vote. One of the reasons Hillary Clinton defeated Barack Obama soundly in the California primary is because Asian-American voters favored her by an almost 3-1 margin. California is No. 2 in the country in the percentage of Asian-Americans behind Hawaii. No. 3 is Washington State and its caucuses are Saturday. Will the same thing happen again? And just why is that happening? Asian-Americans comprise a wide segment of voters; they are from countries ranging from Japan, China and Hong Kong, to India, Vietnam and the Phillipines. We talked to many of them to find out some answers for our story on AC360° tonight. There’s a fascinating new report out that says 57% of federal and state government employees surveyed have witnessed violations of ethics standards, policy or law in the last year. Think about it: there are more than 2.5 million federal employees and more than half a million state employees. If that 57% is even close to accurate, that’s a lotta ethics lapses. And that got us at AC 360 wondering — just what kinds of ethics lapses are we talking about here?! So we’re reaching out to YOU. We want to hear from public servants who have seen this kind of thing in the workplace. Things like conflicts of interest, alteration of documents. Lying to the public. The kinds of things the government shouldn’t be doing. Did you see something? Did you report it? Who did you tell? What was done about it? Tell us about stories that need exposing. Your name will be kept confidential, unless you agree at some point to reveal it. If you must, send your tips anonymously, but please provide us a way to contact you. We promise to read every e-mail you send. A representative sampling found 57% of government employees observed a violation of ethics standards, policy, or the law in the past year. Those are the stats – But what is done about it? 21% believe that top leadership is not held accountable for their own ethics violations. Remember the 2004 electoral map – largely red, with a smattering of blue along the edges? We were a nation divided, with landlocked states voting Republican and Pacific, North Atlantic and some Great Lakes states voting Democratic. The “red state,” “blue state” divide was palpable. Fast forward to (Super) Tuesday night. If you look at the turnout in “red states,” or states that went for Bush in 2004, the numbers indicate a significant shift in the electorate. Democrats had a larger turnout in all “red states,” save for three - Utah, Arizona, and Alabama. In North Dakota, for example, a state where 63% of the vote went for George Bush in 2004, democrats outnumbered republicans by a margin of almost 2-1 in the state’s caucus on Tuesday night. In Georgia, where Bush won 58%, to Kerry’s 41% in 2004, more than 90,000 more democrats voted in the state’s primary. While primary turnout doesn’t necessarily translate to the general election, it certainly is one indicator that we may see a more fluid electoral map come November.